Flying Banners take a couple of minutes to put up and look great even on still days. The whip flagpole which supports them ensures that the banner is always held open and visible even if there is no wind. We can supply different outdoor banners that are a versatile indoor/outdoor billboard that can be used for single and double sided presentation. It’s an ideal promotional solution for outdoor events, advertisements, exhibitions and public areas such as airports and shopping centers. 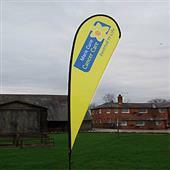 The portable bow flags with bow shape fabric banners. Automatic wind direction feature allows the flag to rotate accordingly. The oxford fabric bag is easy transport and quick assembly and for poles and base foot use. It is with Choice of bases for a variety of applications. 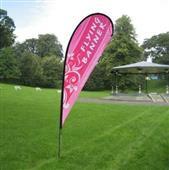 single sided or double sided flying banners are a very nice outdoor flags used for outdoor event. Wind Fly Banners constantly display your company’s message from any angle, so they make excellent event banners and outdoor banners. Blade flying banner product in nice styles and quality levels to assist with almost any budget. Custom bow flags and custom bow banners are new and unique products in the advertising flags world.The bow flying banners are also great if you are looking for a personal, stylish and original touch in your indoor events. These flying banner or flying flags are available in 14 different colors and a multitude of messages just right for your needs. Choose from one of our standard Wind feather Advertising Flags or have a custom Wind feather advertising flag designed for you. Call or email for rates on customizing text on your promotional flag! These advertising flags or flying banners are available in 14 different colors and a multitude of messages just right for your needs. Choose from one of our standard Wind feather Advertising Flags or have a custom china advertising flag designed for you. The Quill Flying Banners belongs to the outdoor flying banner that can be used in tradeshow, events, outdoor activities, and pavement display. The flying banners come with a fabric bag for easy carrying. We can do different size as your need in your artwork. We can finish them in short delivery time with nice quality. 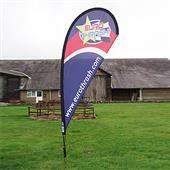 Advertising feather flags will not only a big boom for your business but they will also brand awareness among buyers. Promotional advertising flags are an excellent advertising tool to brand awareness and help drive traffic from the door at your next Grand Opening, Store Promotion.